It is clear that a piece of artwork such as the Greco-Roman mosaic glass bowl being offered at the Phoenix Ancient Art Gallery in Geneva was a luxury available to only the wealthiest individuals of the 1st century B.C.E. Extremely time consuming and labor intensive to produce, it is quite a rarity to find an example of mosaic glass of such immense quality and in such good, virtually intact, condition. a? 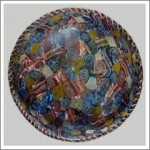 ?Although mosaic glass was not uncommon in ancient times, few vessels of comparable quality and condition exist today.a?? a? ?We are quite fortunate to have found such a remarkable piece and feel very lucky to be able to present it for others to enjoy.a? ?